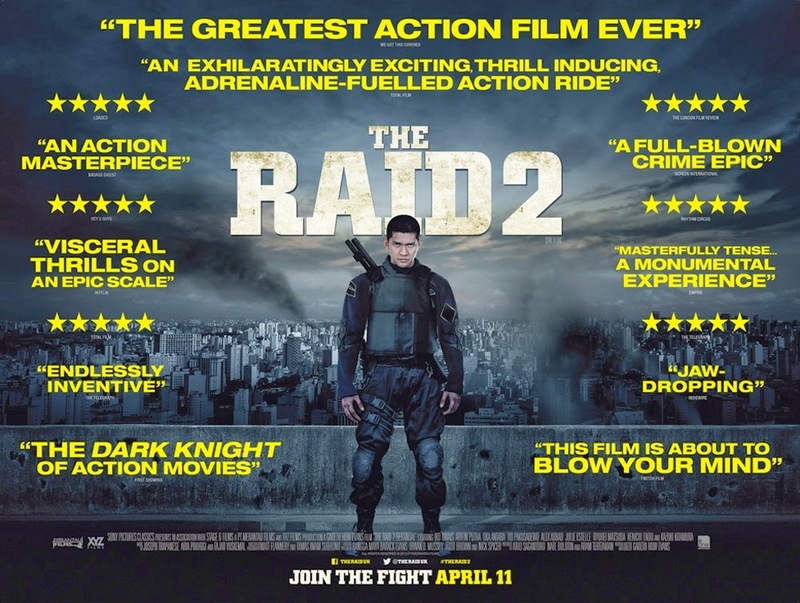 As previously mentioned, I have been very excited for the release of the sequel to the action film masterpiece The Raid Redemption. This weekend, I saw The Raid 2: Berandal and went to great lengths to make sure I would be able to. The movie came out as limited release this weekend and would be released in more theaters the following week. However, my friends and I were so anxious to see this movie that we drove an hour to go to a theater that had it and we bought our tickets online to guarantee our seats (which turned out to be a brilliant idea because it was actually sold out). The excitement in the theater was palpable as everybody sat in their seats waiting for the lights to dim and for the previews to end, signaling awesomeness was going to be witnessed. I walked into that theater with ridiculously high expectations due to all the hype that surrounded this sequel, including that it was the next Terminator 2 of sequels, and if anything this movie was under-hyped. It was that good. This movie picks up directly from where the last one left off, but this time Rama (the protagonist) gets involved in an undercover cop scheme to exploit the crimes of the mob bosses running Jakarta, Indonesia. This scheme involves him going to jail and becoming friends with one of the bosses’ sons and ultimately joining the mob while maintaining his undercover identity. However, things go sour due to miscommunication and suspicious activity from the cop who hired him for this job and from activities going on between the different mobs. 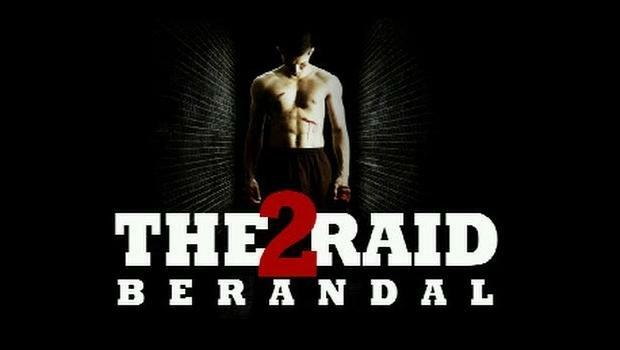 The Raid 2: Berandal had much more story and plot in comparison to the movie that preceded it and it was a wonderful change. The first movie was very simple: cops fight their way up the tower and fight the mob boss. This one has much more complicated story compared to the first movie but at the same time it wasn’t too overwhelming. This movie being an action/martial arts film, it is known that walking in there is going to be some level of violence. However, this movie does have a lot of violence and some gore, so just as a warning for those who don’t like those types of movies. First off, I would like to say that the cinematography of this film is much better than that of the first movie and is absolutely breath taking. The more cinematic, landscape-type shots were very placid and calm in contrast to the more fast paced parts of the film. The camera work for the fight scenes is mind blowing in how I still don’t understand how they were able to film everything so perfectly. One scene had a car chase and a fight happening in one of the cars, and the way the camera weaves through the different parts of the car was so smoothly done. In addition, their ability to capture the different angles of the hand to hand combat was beautiful. The fight choreography was done in such a manner that the moves went together and flowed almost like a ballet, but more violent. I truly believe that this movie is revolutionary when it comes into terms of action films and the approach to how it is filmed. It is a testament to how such a quality film can be made without a large budget or fancy, expensive special effects. However, one thing that is disheartening is that American filmmakers want to make The Raid franchise but with American actors. I believe that a film like this shouldn’t be remade to fit a more mainstream audience, it should just be remembered by how it is and how it was originally intended to be seen. This movie will inspire aspiring directors and filmmakers and one day they will remix The Raid franchise into something new and different for the future generations. I highly recommend this film to any action movie fan and especially if you are into martial arts/hand to hand combat. You can count me in to watching this movie again in theaters when it is released to all theaters. 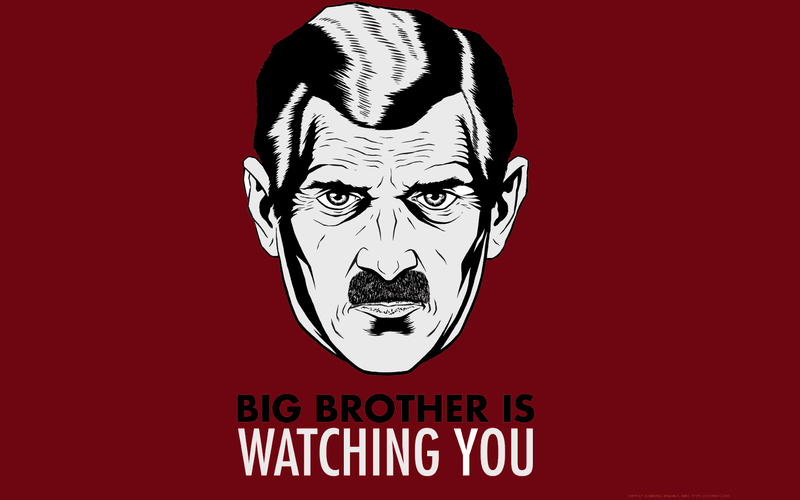 I am currently reading the classic, 1984, by George Orwell and it got me thinking about other dystopian works. I recently recalled watching Total Recall (the original with Arnold), no pun intended, and couldn’t help but thinking just how recently a lot of dystopian works have been released, both literary and cinematic. In addition, it got me thinking about my favorite dystopian films and it is important to set the parameter as to what is considered a dystopian film. I consider a dystopian work as one that shows a society set in the future marked by a controlling, oppressive power that results in poverty, pollution, violence, or corruption. Demolition Man , starring Sylvester Stallone and Wesley Snipes, was made in 1993 and centers around the Los Angeles area in the year 2032. Apparently after a massive earthquake in 2010, the city of Los Angeles and San Diego merged together to form San Angeles. San Angeles is a place where it seems as though all crime has been eliminated due to very strict laws outlawing basically anything that could be considered immoral or dangerous. 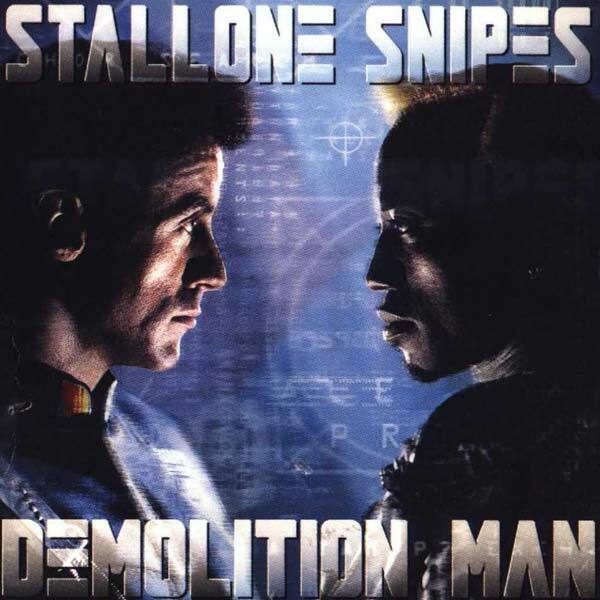 The plot centers around a police officer, John Spartan (Stallone), and criminal, Phoenix (Snipes), who fight during the 1990’s. After an incident that kills several civilians, they both get cryogenically frozen and are later thawed in 2032 after their sentence ends. These two then must cope with the “utopian” future where any sort of vice is outlawed and everybody lives lives that seem to be eerily happy and content. However, it is later revealed that they are restricted of many things and this new future has created an underground society that lives much like life before all of the advancements. Spartan helps the San Angeles Police Department to catch Phoenix as the police department alone do not know how to deal with a criminal from the past, a seemingly alien world in comparison to their present. This movie beautifully shows the effects of what seems to be a utopia can actually be quite the opposite. The restrictions and laws passed in order to try and make the world a safer place end up putting the civilians in a place of ignorance, where they only know one way of life. I recommend this movie for fans of action movies. Minority Report, starring Tom Cruise, is set in the Washington DC area in the year 2052 and is directed by Steven Spielberg. The society is full of technological advancements and in fact the police department is able to detect crimes before they even happen, known as PreCrime. Tom Cruise’s character, John Anderton, is the Captain of this unit and he then becomes the victim of this very system one day. The Department of Justice tries to outlaw this PreCrime unit from going nationwide and then it is predicted that John will murder someone in 3 days. John tries to hide the case and flees because he believes that it is a set up from the Department of Justice. The PreCrime system is fueled by three psychics and it is explained that they all see different versions of the future but the one that is published for PreCrime is the version that is agreed on by two of the three. The “Minority Report” is the version of the future only seen by one of the psychics and these are usually ignored and thrown away. John kidnaps Agatha, one psychic that is more prone to seeing the Minority Report, and tries to hid from the massive manhunt trying to arrest him for a murder he hasn’t even committed yet. The rest of the movie follows this plot line and explores the idea of free will and determinism. This movie shows the flaws of a society that is too controlling and tries to streamline everything through technological advancements while exploring existential concepts. The idea of a future of being accused of something that is in the future is scary because then it implies that there is no free will in the world. 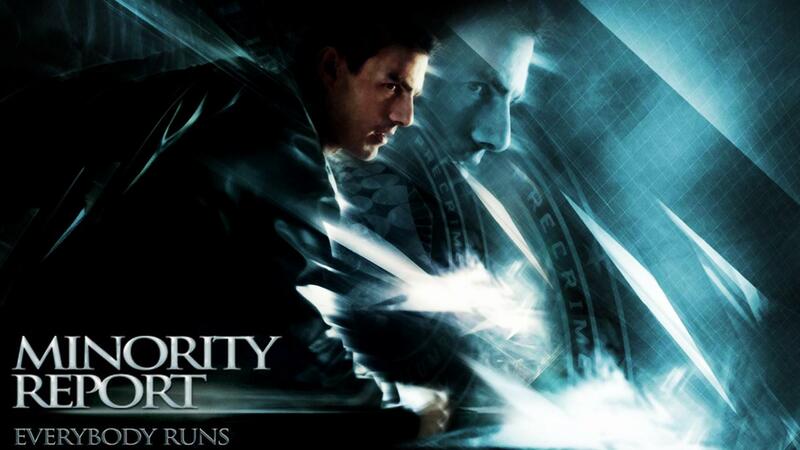 This is an excellent movie and is highly recommended for sci-fi thriller movie fans. Total Recall, starring Arnold Schwarzenegger tells the story of a Douglas Quaid, a construction worker from Earth, in the year 2084. The movie starts off with him waking from a dream he has where he is exploring Mars with a mysterious women that keeps appearing in all of his dreams. He tells his wife that he wants to go and visit Mars, because at this point in the future Mars has been colonized. Due to riots from rebels and inhabitants, his wife says that going to Mars on a vacation would be too dangerous. Discouraged, Quaid goes to work and on his way learns of a company that can implant memories into your mind and it would feel as though you actually did whatever they implanted. He decides to sign up for a trip to Mars as a secret agent but before the procedure can be done he starts to violently react and storms out of the laboratory. He goes home and is then attacked and almost killed by his “wife” who turns out to be working for the governor Cohaagen. He is then suddenly confused as to why everybody is trying to arrest and kill him. However, he finds a video of himself directed toward himself where he is called Hauser. Hauser tells Quaid to go to Mars and find the rebel leader Kuato. The rest of the movie continuess Quaid’s journey to Mars to find Kuato while he struggles realizing whether he is in a dream or not. The dystopia in this film could be both Earth and the colonized parts of Mars. On Earth, the politicians are corrupt and seem to control every aspect of the peoples’ lives through surveillance and connections. On Mars, the groups that are wealthy or that have political connections live fabulously and don’t have to worry about the things that the lower classes do. The lower classes live in areas that aren’t completely blocked from the radiation due to malfunctional shields and they resort to more illegal economic activities for income. Out of this anger and frustration for their living situation, some people formed rebel groups to take down the higher class that s solely concerned with mining operations. Dystopia’s remind us about the corruption that could arise from the depths of humanity and the consequences of such actions. They can also be used to compare our current society with that portrayed in the works and just how eerily close we can get to the dystopia through only a few small steps. When I watched I, Robot for the first time, this image that Sonny the Robot drew is what stood out to me the most. Now, whenever I hear dystopia this is the image that pops up immediately in my mind. 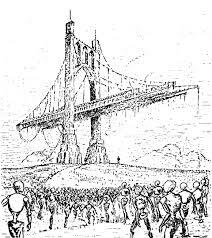 I think it is because it consists of a large quantity of humanoid figures looking to a singular figure in the distance below a bridge out of hope. They hope for a better future and are desperate, but nobody knows where that figure or bridge will take them. Unfortunately, this desperation and longing for hope is what drives people to societies that often oppress them or take advantage of them. As previously mentioned in a post, I have claimed The Raid Redemption to be one of my favorite modern martial arts/action films of all time. Last Tuesday, The Raid 2 Berandal premiered at the Sundance Film Festival and I was waiting that night for reviews of the film. I patiently waited until early morning the next day and finally…word came out. Suddenly, a flood of attention and hype came on other blogs and movie review sites appeared. Let the hype begin. The Raid 2 Berandal is supposed to pick up immediately following the first film and follows the story of Rama, the protagonist, in his journey to take down the crime underworld of Jakarta, Indonesia while undercover. For those of you that have seen the first film, you will understand where I am coming from when I say it is not the type of movie you would watch for its story, its more about the action. However, from what I have read and heard, the plot in this movie is much more captivating in depth and expansive. The action scenes and stunt work is also supposed to be revolutionary. 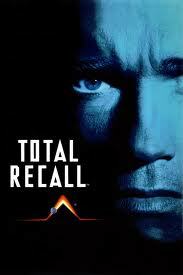 In fact, this movie has been called “one of the greatest action sequels since Terminator 2: Judgement Day”. That kind of comparison is something that you just don’t throw around. 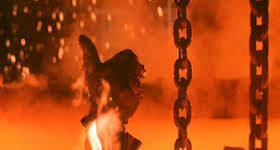 I grew up hailing Terminator 2: Judgement Day as one of the greatest movies of all time. I mean the last scene where Arnold goes down on the chain and sacrifices himself for the sake of humanity that was a pretty emotional and heavy scene. On top of that, the special effects James Cameron implemented where revolutionary in the sense that it added a new dimension to action films, CGI. Even he gives The Raid 2 a thumbs up. Mary Shelley’s Frankenstein is not only a classic novel, but it has become the basis of a variety of movie genres, from horror to science fiction. The story of Frankenstein, a scientist who aspires to create life and when he does his creation fumbles out of his own control, has been referenced to and remixed in works of literature, movies, and popular culture. At the time of Mary Shelley, science was about to reach another revolution as the potentials of science weren’t quite realized to a majority of people. It was apparent though that science could intrude upon the beliefs of religion and ethics. Mary Shelley uses the idea of ethics and of the unknown potential of science to fuel the true horror evoked by Frankenstein. The story of how this novel has gotten to the level of popularity it reaches today starts with the novel itself. The book at first got mixed reviews but over time it gained a following. At the turn of the century, the first film adaptation of it was made by Edison Studios in 1910 as a Silent short film. However, this would not get the reception that the Universal Studios’ version staring Boris Karloff would receive in the 1931 version. This movie solidified and introduced the horror genre to popular culture, while also setting up a kind of archetype for horror movies at the time. The idea of man playing God and the consequences that follow captivated the minds of audiences everywhere. 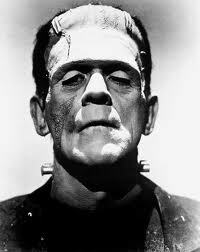 This and the rest of the Frankenstein movies by Universal built upon this idea. These movies helped to build the idea of the mad scientist in the laboratory whose own creation spins out of his own control. Actually, Frankenstein brought the idea of one’s own creation being more than what the creator could handle, which has been an important staple in the science fiction world. The ideas presented above have influenced a variety of famous movies, from action to science fiction. 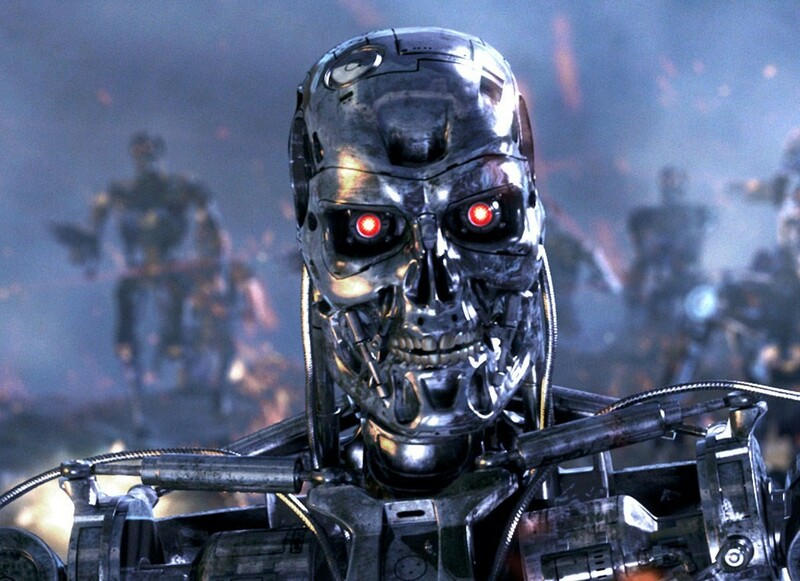 For example, The Terminator franchise builds upon the idea that man won’t be able to control its own advancements when it comes to robotics and computers. The idea that machines will rise against man creating a skull filled post-apocalyptic world terrified audiences upon being released since at the time in the 1980’s advancements were being made in computers. In Jurassic Park, man tries to play God again by bringing back dinosaurs through modern genetics in order to create an amusement park. In the words of Jeff Goldblum, “Uh…uh…Life finds a way.” Yes, yes it does, as then the dinosaurs escape and terrorize the island. Once again, playing on the potential fears of the time, as in the 1990’s advancements in genetics and cloning brought new scientific ethics to the field. These classic movies, just like in the times of Mary Shelley, is a response to potential fears at the time. With basketball season already in full swing, I have been glued to the TV watching my favorite match ups of the day while also keeping up with my fantasy team. In addition, I along with two of my friends are creating a basketball league for teenagers in our community, because we realized there weren’t any competitive basketball leagues at the high school level that were outside of playing for the high school or travel ball. Thus, we decided to work together and create one for kids who for whatever reason couldn’t play for their high school or they couldn’t afford travel ball. We have decided to name it the ABA, to bring back the notion of “let’s just play basketball and have fun” that was what kind of characterized the ABA back in the day where it rivaled the NBA. I will be posting a link to my basketball league’s page and videos in posts and be sure to keep all of you updated. However, to celebrate the launch of the beginning of our setting up process, I have decided to compile my favorite basketball movies. This classic 80’s movie stars one of the most iconic actors of the decade, Michael J. Fox. In Back to the Future, he played Marty McFly on his adventures through time with Dr. Emmett Brown, played by Christopher Lloyd. 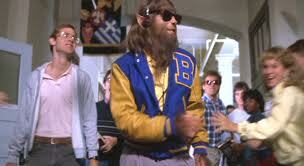 In Teen Wolf, Fox plays an average teenager who happens to be on his school’s not so great varsity basketball team. On his team he isn’t a star but it is more like he’s just there (and the tension between the team doesn’t help). Along with the troubles of his basketball team, he is also troubled by average things like not being popular, school, girls, and oh yea being a werewolf. One night when he gets home, he starts getting a really funny feeling and rushes to the bathroom. Upon looking in the mirror, he discovers he is turning into some sort of monster and soon discovers it runs in his family, as his father is also a werewolf. Now, he isn’t like a new “Twilight” werewolf or savage by any means, in this movie he just becomes furry and also becomes more athletic. You can imagine there are few werewolves in your typical high school, so Scott (his character’s name) suddenly gets launched into stardom when in a game he fails to hide his alter ego. He gets angry during a basketball game and suddenly transforms into a high flying werewolf. This movie doesn’t focus so much on basketball the sport, but uses it as a medium to tell the story. 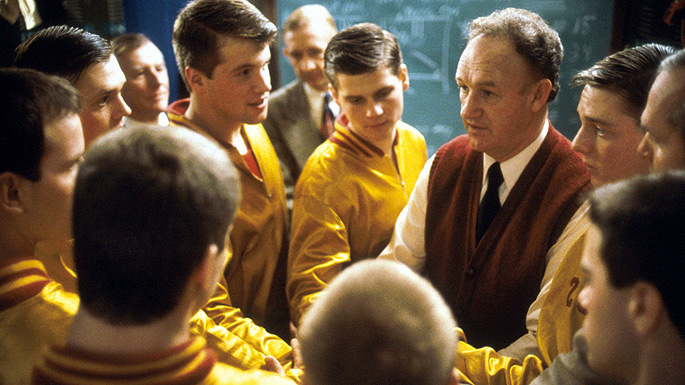 This is one of the quintessential basketball films as it is a story on not only the competitive aspect, but the philosophy behind the game. As far as the plot, it is similar to a more recent movie, Remember the Titans, in the sense that there is the plot development between a community and a new coach being brought in for the high school team. Similarly, the community at first is uneasy about the new basketball coach, Dale, and also that the town basketball star, Jimmy, refuses to play for Dale due to how he was so attached to the old coach. Dale introduces a new playing style that doesn’t quite yield the results the community hoped for and threaten to get rid of him. However, Jimmy decides to play and this turns things around for the team. The team ends up going to to the state championship and wins it all with everyone on the team stepping up along the way. This movie is an excellent movie, as to not butcher the beautiful messages and inspiration in the movie, I highly suggest you watch it if you haven’t. This movie is an inspiring sports drama about the struggles of inner city youth and trying to balance basketball along with their other priorities. In this movie, the great Samuel L. Jackson plays Ken Carter, an alumni of Richmond High School, is newly coached to run the school basketball team. He is disappointed in the activities and behavior of the team and before he can teach them basketball he must team them about life. He forces them to study and has them sign contracts to make sure they wouldn’t neglect their studies. The movie really focuses on how life and sports are interconnected in both values and responsibilities. However, when drama occurs in some of the players’ lives and Carter’s son joins the team things get much more complicated. Carter is so serious about changing his players’ lives for the better that he closes the gym until the players improve their games. This movie is an excellent example of how sports relates to life and how it can be a medium for self-improvement. The inception of the movie industry not only invokes a sense of nostalgia but shows the expressive spirit of mankind. In 1912, Carl Laemmle founded Universal Studios, what would be one of the leaders of cinematic innovation for years to come. He set up the entire enterprise from just a few nickelodeons and revolutionized the movie industry. A new medium was introduced, film, and it brought the world to its knees. He encouraged people to explore and innovate, the rest is cinematic history. Growing up, my father owned a chain of movie theaters and I was very interested in the industry. I would always try to help my father in whatever way I could and frequently watched films in the theater. To this day, one of the most awe inspiring and impressionable things I have seen is the introduction to every single Universal Studios production. Yes, the iconic, trumpeting music playing while the shimmering, radiant Earth revolving while the words “Universal Studios” appear. I always felt it was a testament to the creative nature of man and how the world is our canvas for innovating ideas and to ultimately share them. The success of Universal didn’t just come from luck, it came from the hard work of aspiring individuals. From Steven Spielberg to Ron Howard, innovators have helped to shape not only how cinema has progressed through the years, but how people think. Thinking big. Expressing sentiments and ideas.